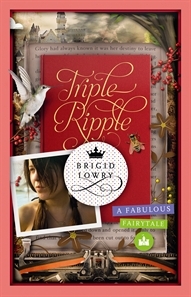 Brigid Lowry’s original fairytale with a modern twist will totally charm romantic girls . It’s a clever story that combines a fairytale and a modern-girl’s tale, and reveals the magic of the writer’s creative journey. The Writer begins with a sparkly good idea for a fabulous fairytale. A girl called Glory is sent to work in the Royal Palace, where the queen is planning a grand ball and a bad-tempered princess is sorting through jewels and tiaras. And, unknown to Glory, the threads of her destiny are coming together. Nova is reading the fairytale. Fairytales are not usually her thing, but right now she’s feeling a bit messy and lost. Her best friend has gone away and bitchy Dylan is hassling her. Still, Nova is curious to find out why Glory’s mother is scrabbling under the bed for an old magic book. Can the Writer make everything turn out happily ever after? Will the princess find true love? Will Glory escape a secret curse? And can Nova smooth out the lumps and bumps in her life?